Can One Use Mueller-Navelet Jets at LHC as a Clean Test of QCD Resummation Effects at High Energy? The understanding of the high energy limit of QCD, in the so-called perturbative Regge limit, has been the subject of many studies. Many observables have been suggested to test these dynamics, based on inclusive , semi-inclusive  and exclusive processes . In this limit, the smallness of the strong coupling can be compensated by large logarithmic enhancements of the type which have to be resummed, giving rise to the leading logarithmic (LL) Balitsky-Fadin-Kuraev-Lipatov (BFKL) Pomeron . Mueller and Navelet proposed to study the production of two jets with a large rapidity separation at hadron colliders . In a pure leading order collinear treatment, these two jets would be emitted back to back, while a BFKL approach allows some emission between these jets which should lead to a larger cross section and lower angular correlation of the jets. We present results of a full next-to-leading logarithmic (NLL) analysis, in which the NLL corrections are included for the BFKL Green's function  and the jet vertices [7, 8]. In the following we will focus on the azimuthal correlations  and ratios of these observables, as well as on the azimuthal distribution, at a center of mass energy TeV, which have been measured recently at the LHC by the CMS collaboration . We make some comparison of our results  with these data and investigate the dependency on the various scales, including the renormalization scale. comparison of our results  with these data and investigate the dependency on the various scales, including the renormalization scale. with and The expression for the NLL corrections to the Green's function resulting in can be found in Eq. (2.17) of . The expressions of the NLL corrections to the jet vertices are quite lengthy and will not be reproduced here. They can be found in , as extracted from  after correcting a few misprints. They have been recently reobtained in . In the limit of small cone jets, they have been computed in  and applied to phenomenology in [17, 18]. Here we use the cone algorithm with a size of . Note, however, that using the kt or the anti-kt algorithm leads to negligible changes in our predictions. Our calculation depends on the renormalization scale , the factorization scale and the energy scale . In the following we set . We choose the “natural” value for and , and vary these scales by a factor of 2 to estimate the scale uncertainty of our calculation. We use the MSTW 2008 PDFs  and a two-loop running coupling. We also include collinear improvement to the Green's function as was suggested in  and extended for in [13, 14, 21]. In  we performed a detailed study of several BFKL scenarios, from a pure LL approximation (LL Green's function and leading order jet vertex) to a full NLL calculation (NLL Green's function and NLL jet vertex). The main conclusion is that there is a dramatic effect when passing from a mixed treatment, which combines LL vertices with NLL Green's function, to a full NLL approach, of magnitude similar to the one when passing from a pure LL result to the mixed treatment; the inclusion of NLL corrections inside the jets vertices is therefore essential. Note that the effect of collinear improvement in the NLL Green's function is very small when using the NLL jet vertices. The inclusion of the whole set of NLL corrections leads to decorrelation effects which are much smaller than expected. Still, there remains a sizable difference between the full NLL approach and the fixed order predictions at next-to-leading order (NLO) for the ratios and , when taking into account theoretical uncertainties. This is illustrated for the ratios and in Fig. (2). In this figure, we show the variation of our NLL result when varying and by a factor of 2 and compare it with the Dijet prediction. Here the fixed order NLO calculation is significantly above the full NLL BFKL calculation. These observables are quite stable with respect to the scales so that the difference between NLL BFKL and fixed order NLO does not vanish when we take into account the scale uncertainty. Comparison of the full NLL BFKL calculation including the scale uncertainty with Dijet predictions, using asymmetric cuts defined in Eq. (12). Left: value of <cos2φ>/ <cosφ> as a function of the rapidity separation Y. Right: value of <cos3φ>/ <cos2φ> as a function of the rapidity separation Y. These are the cuts used by CMS in , with the exception that for numerical reasons we have to set an upper cut on the transverse momenta of the jets. We have checked that our results do not depend strongly on the value of this cut as the cross section is strongly peaked near the minimum value allowed for kJ,1 and kJ,2. This enables us to compare our predictions with LHC data. We begin our analysis with the azimuthal correlations . In Figs. (3, 4) we show the variation of , and with respect to the rapidity separation between the two jets Y within a full NLL framework. We display the theoretical uncertainty obtained when varying and by a factor of 2 and we compare these predictions with CMS data (black dots with error bars). We see that NLL BFKL predicts a larger correlation than seen in the data, but these observables are strongly dependent on the value of the scales. Comparison of the full NLL BFKL calculation including the scale uncertainty with CMS data, using symmetric cuts defined in Eq. (13). Left: value of <cosφ> as a function of the rapidity separation Y. Right: value of <cos2φ> as a function of the rapidity separation Y. The extraction of ratios of the previously mentioned observables was also performed in . In Fig. (5) we show results for and . The effect of NLL corrections to the vertices is important (see [11, 23] for detailed comparisons), but these observables are more stable with respect to and than the previous ones. The agreement with the data is very good over a large range. Comparison of the full NLL BFKL calculation including the scale uncertainty with CMS data, using symmetric cuts defined in Eq. (13). Left: value of <cos2φ>/ <cosφ> as a function of the rapidity separation Y. Right: value of <cos 3φ>/ <cos2φ> as a function of the rapidity separation Y. If one tries to compare the full NLL BFKL prediction with CMS data, we fail to describe the distribution for large values of , corresponding to nearside jets configurations, when taking a “natural” scale We have seen also in Figs. (3, 4) that the data is better described if we use larger values of µ. Indeed, if we let the renormalization/factorization scale vary by more than a factor of 2, one can see that the whole set of CMS data can be very well described within the full NLL BFKL approach with a scale of the order of This is illustrated in Figs. (6-8). Comparison of the full NLL BFKL calculation including the scale uncertainty with CMS data, using symmetric cuts defined in Eq. (13), for <cos 3φ> as a function of the rapidity separation Y. Comparison of the full NLL BFKL calculation with either a “natural” scale µ=kj,1.kj,2 or a large scale µ=8kj,1.kj,2 and the CMS data, using symmetric cuts defined in Eq. (13). Left: value of <cosφ> as a function of the rapidity separation Y. Right: value of <cos2φ > as a function of the rapidity separation Y. Comparison of the full NLL BFKL calculation with either a “natural” scale µ=kj,1.kj,2 or a large scale µ=8kj,1.kj,2 and the CMS data, using symmetric cuts defined in Eq. (13). Left: value of <cos 3φ>/ <cos2φ> as a function of the rapidity separation Y. Right: value of the azimuthal distribution integrated over the range 6 <Y< 9.4 as a function ofφ. We have been able to compare the predictions of our full NLL BFKL calculation of Mueller-Navelet jets with data taken at the LHC thanks to the measurement presented by the CMS collaboration. This comparison shows  that for the observables a pure LL BFKL treatment or a mixed treatment where the NLL Green's function is used together with LL vertices cannot describe the data. On the other hand, the results of our complete NLL calculation do not agree very well with the data when the scales involved, are fixed at their “natural” value. The ratios of these observables are very stable with respect to changes of the scales and our calculation describes the data quite well. 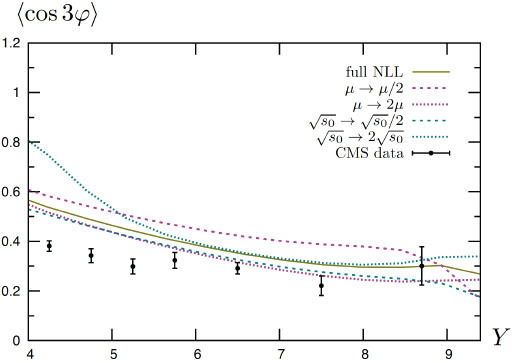 The azimuthal distribution has also been measured by CMS, and its description based on our full NLL BFKL treatment with a natural renormalization/factorization scale fails for the nearside configurations. This description, as well as the description of and is very successful provided one takes a large renormalization/factorization scale, much larger than the natural one. We have shown recently  that this can be understood when fixing the renormalization scale according to the physically motivated Brodsky-Lepage-Mackenzie procedure , in the spirit of [27, 28], which indeed leads to a very good description of the CMS data. To find a fully conclusive evidence for the need of BFKL-type resummation in Mueller-Navelet jets, a comparison with a fixed order (NLO) treatment would be needed. We have compared our predictions with the ones obtained with the fixed order NLO code Dijet in an asymmetric configuration, as required to get stable results in a fixed order approach. We found that for the observables no significant difference is observed when taking into account the scale uncertainties. On the other hand, for and the two calculations lead to noticeably different results. Since these observables are quite stable with respect to scale variations, they are well-suited to study resummation effects at high energy. We thus, believe that an experimental analysis with different lower cuts on the transverse momenta of the jets would be of great interest. We thank Michel Fontannaz, Cyrille Marquet and Christophe Royon for providing their codes and for stimulating discussions. We warmly thank Grzegorz Brona, David d'Enterria, Hannes Jung, Victor Kim and Maciej Misiura for many discussions and fruitful suggestions on the experimental aspects of this study. We thank the organizers, the Tel Aviv French ambassy and the French CEA (IPhT and DSM) for support. This work is supported by the Joint Research Activity Study of Strongly Interacting Matter (HadronPhysics3, Grant Agreement no. 283286) under the 7th Framework Programme of the European Community and by the Polish Grant NCN No. DEC-2011/01/B/ST2/03915. (a) Askew AJ, Golec-Biernat KJ, Kwiecinski J, Martin AD, Sutton PJ. Implications of scaling violations of F2 at HERA for perturbative QCD Phys Lett B 1994; 325: 212-8.; (b) Navelet H, Peschanski R, Royon C, Wallon S. Proton structure functions in the dipole picture of BFKL dynamics Phys Lett B 1996; 385: 357-64.; (c) Munier S, Peschanski RB. High-energy factorization predictions for the charm structure function F2c at HERA Nucl Phys B 1998; 524: 377-93.; (d) Bartels J, De Roeck A, Lotter H. The κ*κ* total cross section and the BFKL Pomeron at e+e- colliders Phys Lett B 1996; 389: 742-8.; (e) Brodsky SJ, Hautmann F, Soper DE. Probing the QCD Pomeron in e+e– collisions Phys Rev Lett 1997; 78: 803.; (f) Rizwan m. journal title Erratum-ibid 1997; 79: 3544.; (g) Bialas A, Czyz W, Florkowski W. Total κ*κ* cross section and the QCD dipole picture Eur Phys J C 1998; 2: 683-9.; (h) Boonekamp M, De Roeck A, Royon C, Wallon S. κ*κ* total cross section in the dipole picture of BFKL dynamics Nucl Phys B 1999; 555: 540-64.; (i) Kwiecinski J, Motyka L. Probing the QCD pomeron in doubly tagged e+e- collisions Phys Lett B 1999; 462: 203-10.; (j) Brodsky SJ, Fadin VS, Kim VT, Lipatov LN, Pivovarov GB. The QCD pomeron with optimal renormalization J Exp Theor Phys Lett 1999; 70: 155-60.; (k) Brodsky SJ, Fadin VS, Kim VT, Lipatov LN, Pivovarov GB. High-energy QCD asymptotics of photon-photon collisions J Exp Theor Phys Lett 2002; 76: 249-52. Mueller AH. Parton Distributions at very small x-values Nucl Phys Proc 1991; 18C(Suppl): 125-32. (a) Ginzburg IF, Panfil SL, Serbo VG. Semihard κκ κ V1V2, κκ κ V + X processes (V = κ0,κ,κ,κ): The possibility of the experimental investigation of the QCD pomeron Nucl Phys B 1987; 284: 685-705.; (b) Ginzburg IF, Panfil SL, Serbo VG. The semihard processes κκκκX, κκκκκ, κκκκκ Nucl Phys B 1988; 296: 569-81.; (c) Ryskin MG. Diffractive J / psi electroproduction in LLA QCD Z Phys C 1993; 57: 89-92.; (d) Mueller AH, Tang WK. 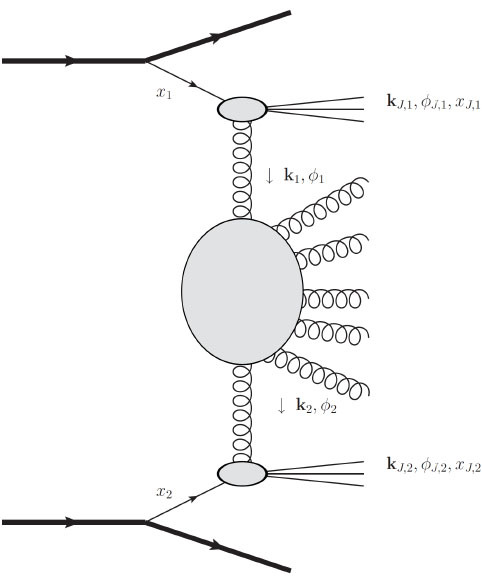 High energy parton-parton elastic scattering in QCD Phys Lett B 1992; 284: 123-6.; (e) Ivanov DY, Kirschner R. Polarization in diffractive electroproduction of light vector mesons Phys Rev D 1998; 58: 114026.; (f) Ivanov DY, Kirschner R, Schafer A, Szymanowski L. Light vector meson photoproduction at large t Phys Lett B 2000; 478: 101-3.; (g) Rizwan m. journal title Erratum-ibid B 2001; 498: 295.; (h) Pire B, Szymanowski L, Wallon S. Double diffractive rho-production in κ*κ* collisions Eur Phys J C 2005; 44: 545-8.; (i) Enberg R, Pire B, Szymanowski L, Wallon S. BFKL resummation effects in κ*κ* ---> κ κ Eur Phys J C 2006; 45: 759-69.; (j) . Erratum-ibid C 2007; 51: 1015.; (k) Segond M, Szymanowski L, Wallon S. Diffractive production of two κ0 L mesons in e+e– collisions Eur Phys J C 2007; 52: 93-112.; (l) Ivanov DY, Papa A. Electroproduction of two light vector mesons in the next-to-leading approximation Nucl Phys B 2006; 7: 2: 183-99.; (m) Ivanov DY, Papa A. Electroproduction of two light vector mesons in the next-to-leading BFKL Study of systematic effects Eur Phys J C 2007; 49: 947-55.; (n) Caporale F, Papa A, Vera AS. Collinear improvement of the BFKL kernel in the electroproduction of two light vector mesons Eur Phys J C 2008; 53: 525-32. (a) Fadin VS, Kuraev EA, Lipatov LN. On the pomeranchuk singularity in asymptotically free theories Phys Lett B 1975; 60: 50-2.; (b) Kuraev EA, Lipatov LN, Fadin VS. Multi-reggeon processes in the Yang-Mills theory Sov Phys J Exp Theor Phys 1976; 44: 443-50.; (c) Kuraev EA, Lipatov LN, Fadin VS. The pomeranchuk singularity in nonabelian gauge theories Sov Phys J Exp Theor Phys 1977; 45: 199-204.; (d) Balitsky II, Lipatov LN. The pomeranchuk singularity in quantum chromodynamics Sov J Nucl Phys 1978; 28: 822-9. Mueller AH, Navelet H. An inclusive minijet cross section and the bare pomeron in QCD Nucl Phys B 1987; 282: 727-44. (a) Fadin VS, Lipatov LN. BFKL pomeron in the next-to-leading approximation Phys Lett B 1998; 429: 127-34.; (b) Ciafaloni M, Camici G. Energy scale(s) and next-to-leading BFKL equation Phys Lett B 1998; 430: 349-54. (a) Bartels J, Colferai D, Vacca GP. The NLO jet vertex for Mueller-Navelet and forward jets the quark part Eur Phys J C 2002; 24: 83-99.; (b) Bartels J, Colferai D, Vacca GP. The NLO jet vertex for Mueller-Navelet and forward jets the gluon part Eur Phys J C 2003; 29: 235-49. Caporale F, Ivanov DY, Murdaca B, Papa A, Perri A. The next-to-leading order jet vertex for Mueller-Navelet and forward jets revisited J High Energy Phys 2012; 1202: 101-28. (a) Duca VD, Schmidt CR. Dijet production at large rapidity intervals Phys Rev D 1994; 49: 4510.; (b) Stirling WJ. Production of jet pairs at large relative rapidity in hadron-hadron collisions as a probe of the perturbative pomeron Nucl Phys B 1994; 423: 56-79. Rizwan m. CMS Collaboration Azimuthal angle decorrelations of jets widely separated in rapidity in pp collisions at TeV CMS Physics Analysis Summary CMS-PAS-FSQ-12-002 2013. Ducloué B, Szymanowski L, Wallon S. Confronting Mueller-Navelet jets in NLL BFKL with LHC experiments at 7 TeV J High Energy Phys 2013; 1305: 096. (a) Kotikov AV, Lipatov LN. NLO corrections to the BFKL equation in QCD and in supersymmetric gauge theories Nucl Phys B 2009; 582: 19-43.; (b) Kotikov AV, Lipatov LN. DGLAP and BFKL evolution equations in the N=4 supersymmetric gauge theory Nucl Phys B 2003; 661: 19-61.; (c) . Erratum-ibid B 2004; 685: 405.; (d) Ivanov DY, Papa A. Electroproduction of two light vector mesons in the next-to-leading approximation Nucl Phys B 2006; 732: 183.; (e) Vera AS. The effect of NLO conformal spins in azimuthal angle decorrelation of jet pairs Nucl Phys B 2006; 746: 1-14. Sabio-Vera A, Schwennsen F. The azimuthal decorrelation of jets widely separated in rapidity as a test of the BFKL kernel Nucl Phys B 2007; 776: 170-86. Schwennsen F. Phenomenology of jet physics in the BFKL formalism at NLO [hep-ph/0703198] 2007. Colferai D, Schwennsen F, Szymanowski L, Wallon S. Mueller Navelet jets at LHC – complete NLL BFKL calculation J High Energy Phys 2010; 1012: 026. Ivanov DY, Papa A. The next-to-leading order forward jet vertex in the small-cone approximation J High Energy Phys 2012; 1205: 086. Caporale F, Ivanov DY, Murdaca B, Papa A. Mueller-Navelet small-cone jets at LHC in next-to-leading BFKL Nucl Phys B 2013; 877: 73-94. Caporale F, Murdaca B, Vera AS, Salas C. Scale choice and collinear contributions to Mueller-Navelet jets at LHC energies Nucl Phys B 2013; 875: 134-51. Martin AD, Stirling WJ, Thorne RS, Watt G. Parton distributions for the LHC Eur Phys J C 2009; 63: 189-285. (a) Salam GP. A resummation of large sub-leading corrections at small x J High Energy Phys 1998; 07: 019.; (b) Ciafaloni M, Colferai D. The BFKL equation at next-to-leading level and beyond Phys Lett B 1999; 452: 372-8.; (c) Ciafaloni M, Colferai D, Salam GP. Renormalization group improved small-x equation Phys Rev D 1999; 60: 114036.; (d) Ciafaloni M, Colferai D, Salam GP, Stasto AM. Renormalization group improved small-x Green’s function Phys Rev D 2003; 68: 114003. Marquet C, Royon C. Azimuthal decorrelation of Mueller-Navelet jets at the Tevatron and the LHC Phys Rev D 2009; 79: 034028. Aurenche P, Basu R, Fontannaz M. Jet–jet and hadron–jet correlations in hadro- and electroproduction Eur Phys J C 2008; 57: 681-8. Ducloué B, Szymanowski L, Wallon S. Mueller-Navelet jets at LHC The κrst complete NLL BFKL study PoS QNP 2012; 2012: 165. Brodsky SJ, Lepage GP, Mackenzie PB. On the elimination of scale ambiguities in perturbative quantum chromodynamics Phys Rev D 1983; 28: 228. (a) Brodsky SJ, Fadin VS, Kim VT, Lipatov LN, Pivovarov GB. The QCD pomeron with optimal renormalization J Exp Theor Phys Lett 1999; 70: 155-60.; (b) Brodsky SJ, Fadin VS, Kim VT, Lipatov LN, Pivovarov GB. High-energy QCD asymptotics of photon-photon collisions J Exp Theor Phys Lett 2002; 76: 249-52.; (c) . Pisma Zh Eksp Teor Fiz 2002; 76: 306. (a) Angioni M, Chachamis G, Madrigal JD, Vera AS. Dijet production at large rapidity separation in N=4 supersymmetric Yang-Mills theory Phys Rev Lett 2011; 107: 191601.; (b) Hentschinski M, Vera AS, Salas C. Hard to soft pomeron transition in small-x deep inelastic scattering data using optimal renormalization Phys Rev Lett 2013; 110: 041601.; (c) Hentschinski M, Vera AS, Salas C. F2 and FL at small x using a collinearly improved BFKL resummation Phys Rev D 2013; 87: 076005.